A lifetime of long dreary winters has me programmed for snuggling up with thick novels. The longer I get to sit wrapped in a fleecy blanket, the better! But as this new and glorious neon-green spring chases away the last vestiges of grey skies and stinging sleet, my attention span grows shorter and my patience thins. Novels sit neglected while my e-reader app fills with short story magazine subscriptions. I can’t complain, either, because we’re in a great new golden age for speculative fiction, with a wide field of talented writers and intriguing venues. 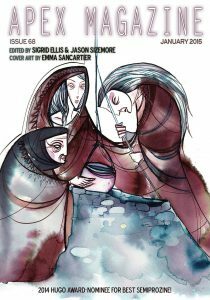 In this column, Beyond the Binary System, I’ll share with you some of the best–and my favorite–speculative fiction short stories from around the web and in print. In keeping with Luna Station Quarterly’s mission statement, every month we’ll focus on stories by cis and trans women and non-binary writers. And, I’ll admit, I’m going into this with a slightly biased eye for the great new writers getting into the game. Bottom line: what I hope you’ll get from this column is an introduction to your favorites for many years to come. Before we jump into this month’s stories, a little bit about me: I live in Ohio, where we get sunny days only 75 times a year and even those we spend complaining about the weather. My day job is in marketing, and the rest of my time is spent reading everything within reach, writing fiction, recording podcast episodes, watching too much TV, and neglecting my website. 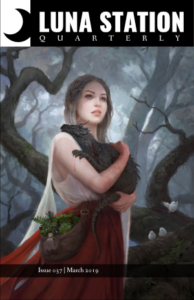 My favorite speculative fiction genres are fantasy, hard and soft sci-fi, magical realism, horror, and fabulism, and it’s a rare romance novel I don’t love. All right! 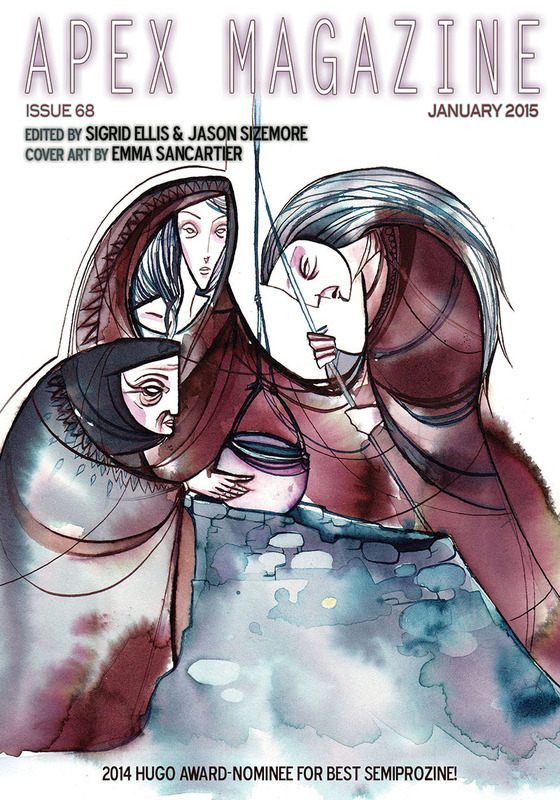 Ready to read some great short stories? This is the place where the old god came to die. Let me tell you a secret about this short story by Ursula Vernon from back in January: I haven’t gone a single day without thinking about it since I first read it. The place described above, a clearing by a pond somewhere in the Carolinas, is as familiar to me as if it were my vacation home. Maggie, the main character who lives there, is the style of grudgingly welcoming and not-totally-abrasive you’d hope a back-country witch would be. Each new revelation in the story was a delight the first time through, and a comfort on each subsequent read. The old god’s last moments could be painful to read, especially for those with a tender loss of their own, but Vernon captures the delicate balance between pain and relief that comes with the end of someone’s suffering and the start of a new cycle of life. The story is funny in parts and charming throughout, so you’re not in for a slog through crumpled tissues and dehydration, either. In one town like this, not too long ago, lived an enterprising young girl. Ugonwoma, her parents called her, as she was the pride of their lives. She was so rich that she built a house in the village for her retired parents before any of her brothers could say taa! and painted it white so that under the sun it was like staring into the flare from a welder’s torch. People would use the house as a landmark in the village: “Take right until you come to the white house,” which made her parents very happy. First, a few words about Omenana, which is a new bi-monthly magazine that started publishing late last year. 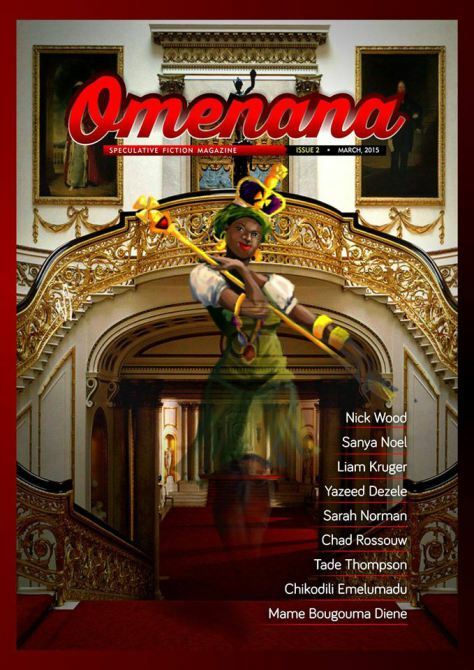 Omenana features established and emerging writers in Africa and throughout the African diaspora, with a particular focus on dispelling the myth that there is no interest in science fiction, fantasy, horror, or magical realism in Africa. All of the stories are free to read online and I highly recommend you bookmark the site. It was so difficult to choose which of their pieces to talk about first! I’m not familiar enough with Igbo literature to whether this is an update of a traditional folk story or if this is entirely her own creation. Either way, Emelumadu has written a beautiful and heartbreaking modern fable that will resonate with any audience. But my favorite thing about the story is that although it reads like one of the treasured fables of my childhood, there is no moralizing to redeem the painful ending. There is only the continuing cycle of hurt and triumph that characterizes so much of life. The women in the story are frustrating and endearing, and the world of the woman–whose name is as fluid as her identity in the village–is rich and vibrant. If I could borrow any extra thumbs, I’d put them all up for Story, Story.